Riley and I spent exactly 5 months back at my folks’ place in Texas, arriving on November 14th and leaving on April 14th. I had lots of time to spend with the folks, which was nice, and got some projects done. This will wrap up the visit and then I will do a few posts about the major projects my dad and I did – new TV setup, upgraded solar system and adding a pantry closet. In February my Lazy Daze friend Kathy came through Austin. I had met her and some other LD women in Bluewater Lake State Park in October 2012, when they were heading home from the Albuquerque Balloon Fiesta that year. Then we got to visit a bit more at Balloon Fiesta this past year. When she posted to the Lazy Daze group site that she would be visiting Austin on the way to New Orleans, I sent a note offering a meet-up. 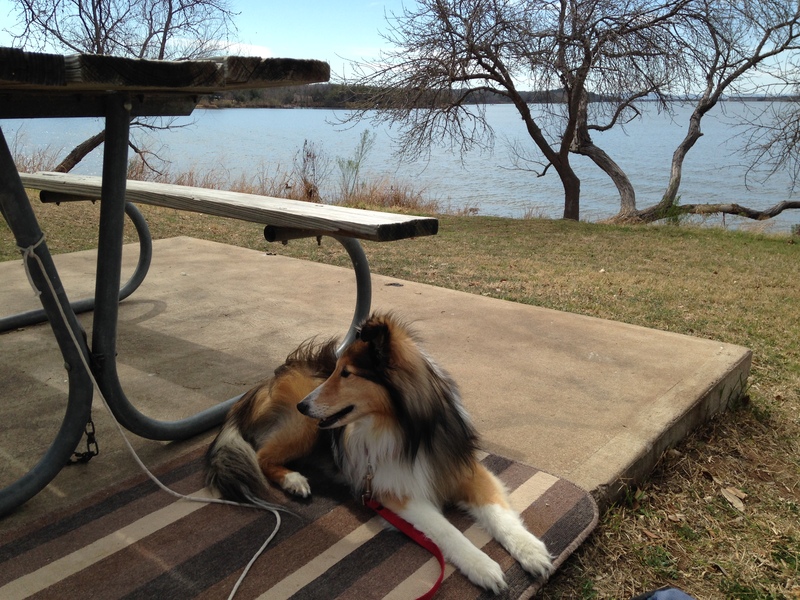 She spent some time at Pecan Grove RV Park near downtown Austin, then drove out to Inks Lake State Park where we met up. We got a couple of nice sites on the lake. The weather started nice, then got cold and rainy for a day, then was cold and nice after. Inks is such a pretty park, on a constant-level lake. It’s always good, no matter the weather. 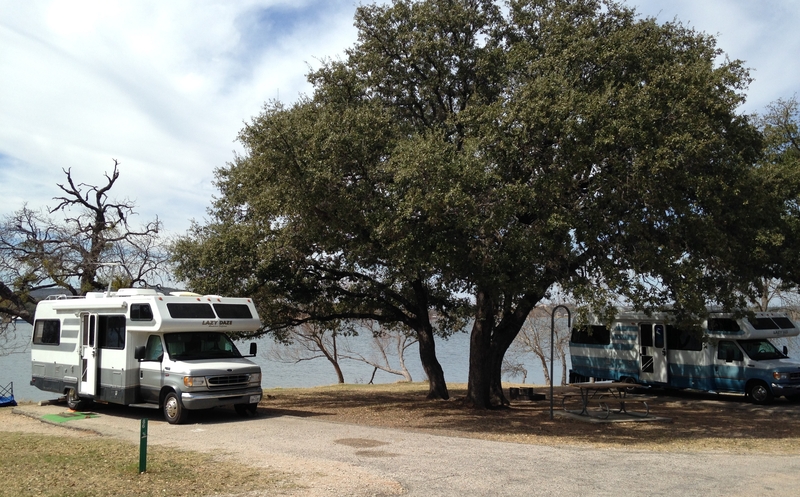 At Inks Lake, my rig on the left, Kathy’s in the shady site on the right. Sudden cold spell caused a heavy mist to rise from the lake. After 4 days at Inks Lake Kathy and I came back to my folks’ place and she enjoyed a bit of driveway camping for a couple of weeks. My dad was able to answer some questions she had and helped with some projects. Kathy wanted to learn to knit hats and I helped her to knit a couple, including the cutest baby hat. 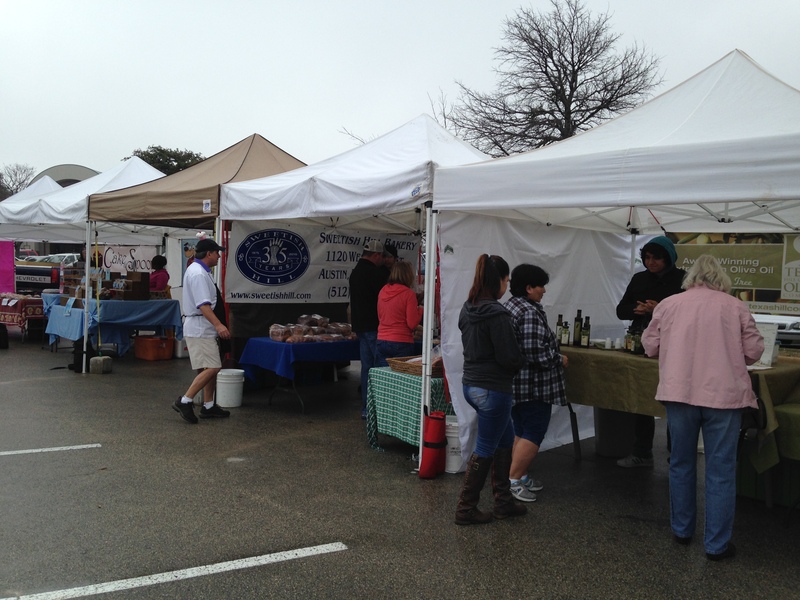 We drove in to Austin to run errands and visited the Lakeline farmer’s market. One night there was a pig roast at the neighbors’ place. There are wild hogs that run around the deer lease they have nearby, and Texas allows year-round feral pig hunting to try to help with the problem. They barbequed/smoked 3 small pigs and we had a feast. 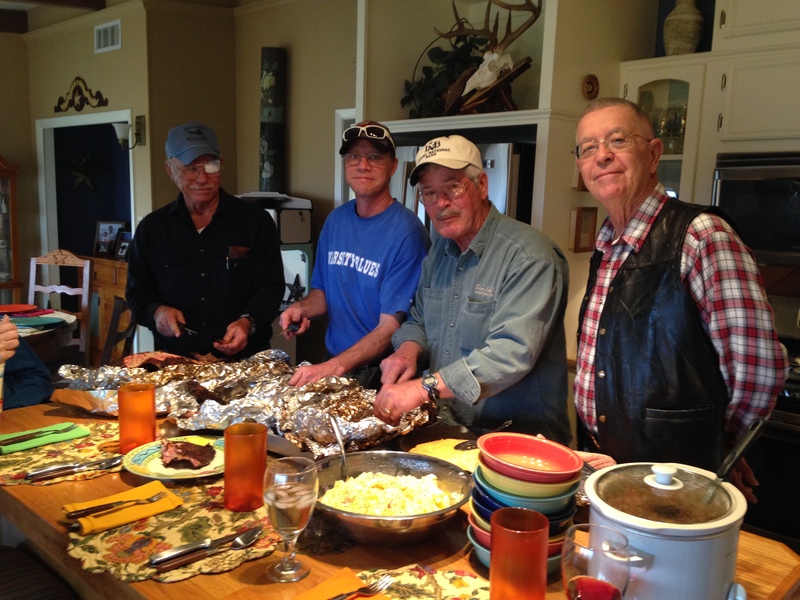 Don, Donnie, and Alan cut up the meat, with my dad supervising. 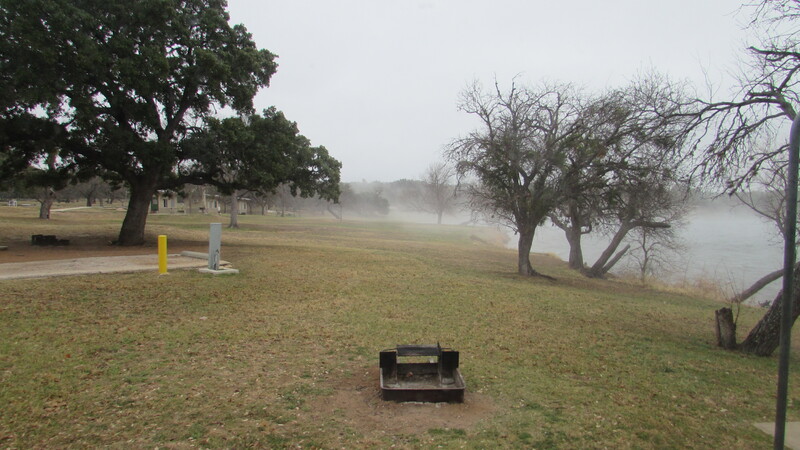 On March 18th, we drove in to Austin to Pecan Grove RV Park on Barton Springs Road. The place was full during South by Southwest, but we were able to get in when it ended. 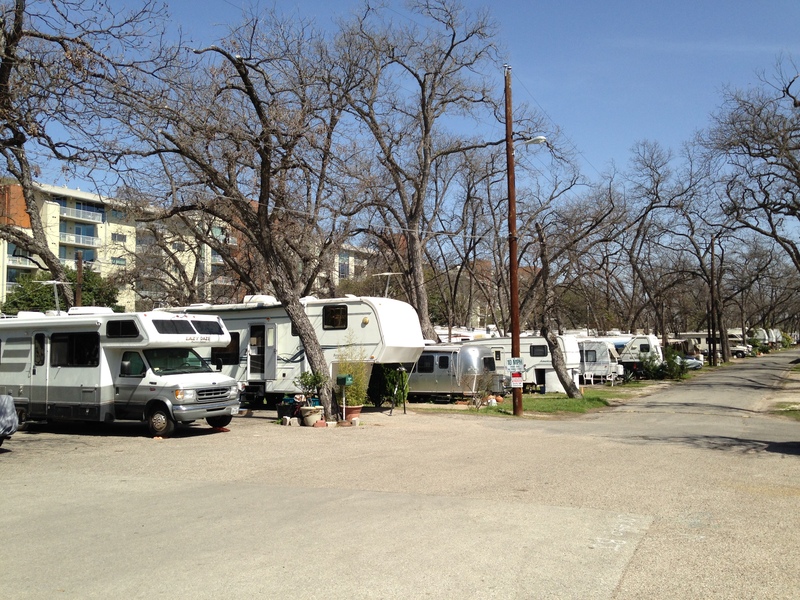 I wanted to camp in Austin, as I hadn’t done that with my RV. Kathy had really enjoyed her prior Pecan Grove visit, and planned to spend a week or 2 back there before heading on from Austin. I just wanted to have a few days in town as a tourist. I got to ride the scooter around downtown Austin and to Trader Joe’s, which was such fun! We checked out P. Terry’s burgers for lunch one day. I had heard of the place, but hadn’t eaten there. They have a location just a couple of blocks away. Good burgers. And Chuy’s is just a block or so away, too. So I got to have my Chuychanga fix. It was nice to have a little mini-trip while mostly stationary for 5 months. On the way back to the lake I stopped to get my generator serviced at Gen-Tech in Leander. 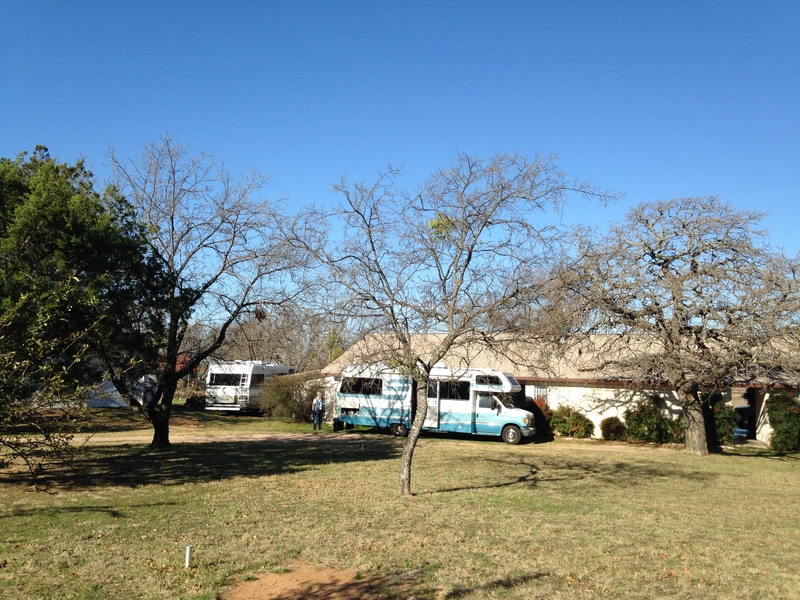 Pecan Grove is densely packed and surrounded by condos, but there is no better place to stay in Austin. 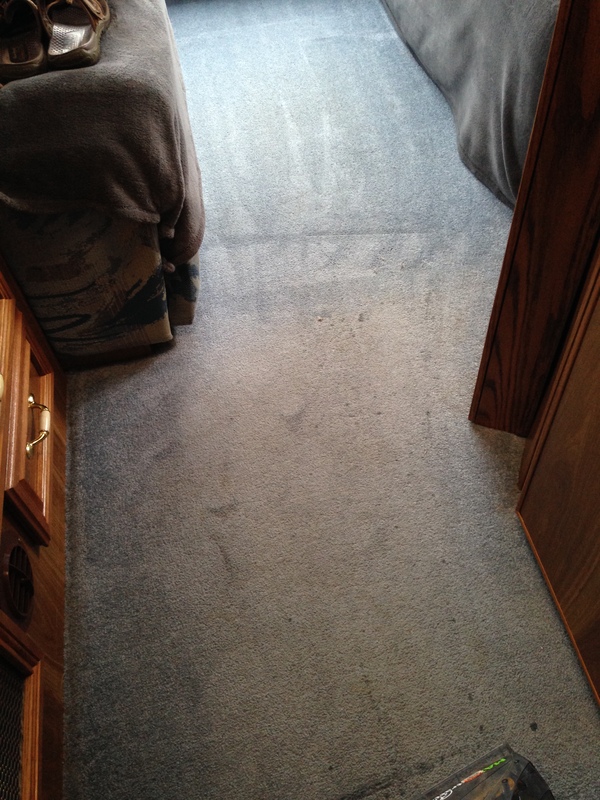 One thing I was glad to get done was shampooing my carpet. I borrowed my brother’s shampoo machine and it made a big difference. I did the section between the couches first and got a before and after shot before starting on the near section. What a difference! I didn’t realize it was that dirty. 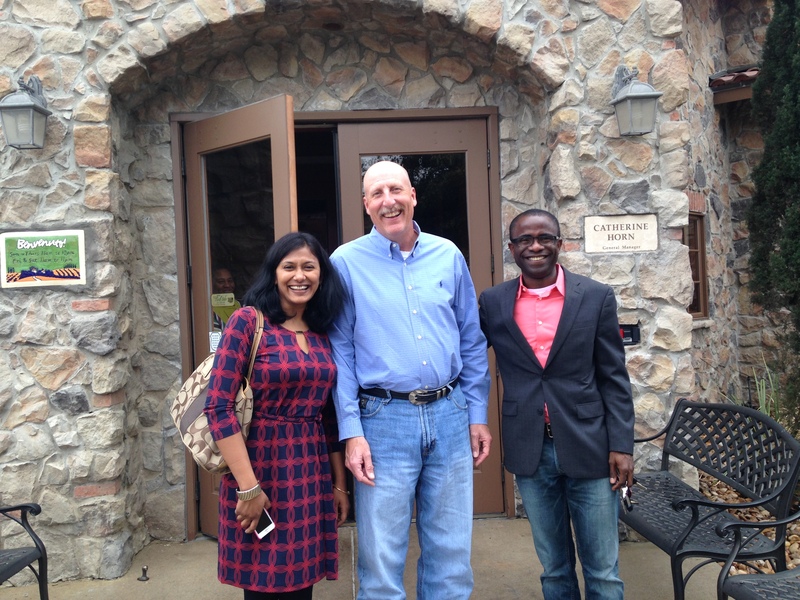 I got to have lunch with some Dell Credit team coworkers while back in the area. 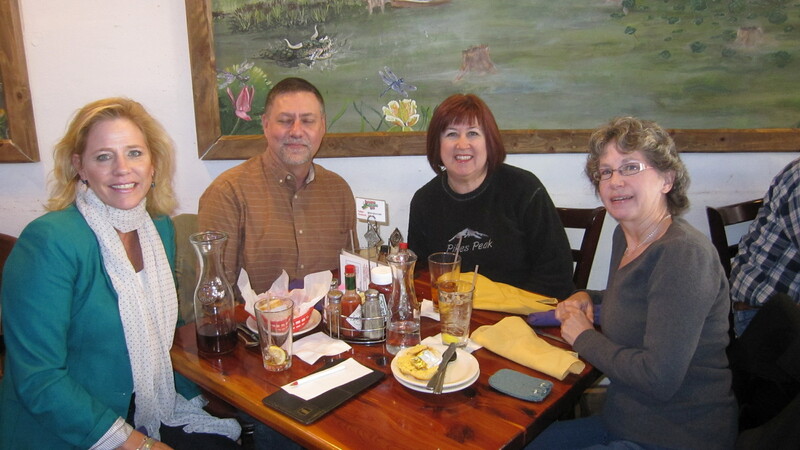 Lori, our Dun and Bradstreet Account Executive, took my ex-boss Mike, co-worker Lynne and I to lunch at Louisiana Longhorn Cafe in beautiful downtown Round Rock. I had not had Etouffee before. Yummy. Always good to see them. On another trip to town I got to have an Olive Garden lunch with the Marketing friends I worked with before leaving Dell. So great to be able to visit with them and catch up on what they are doing, and how Dell is doing now. We had another camper visit, my friend CB. He was relatively close, visiting his sister in Eddy, near Waco, TX. 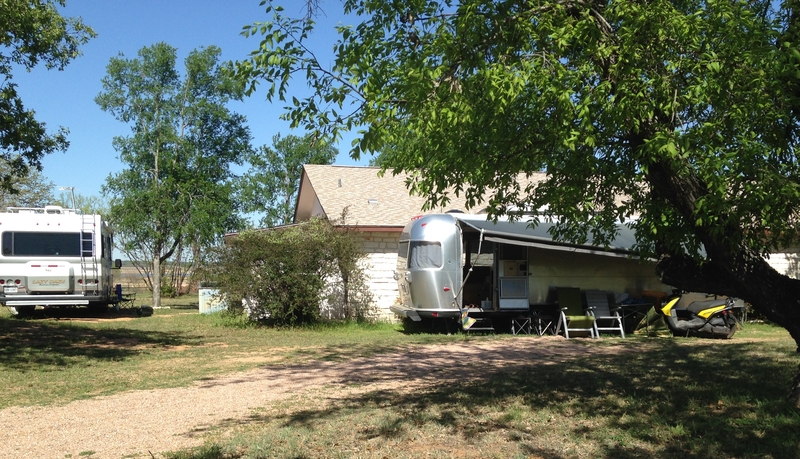 He brought his Airstream and set up a nice little spot for a couple of weeks. 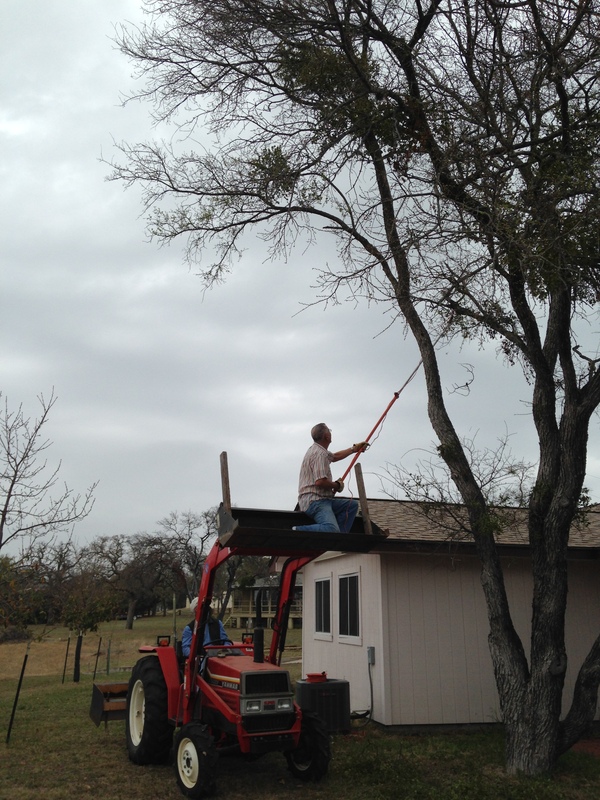 We helped my dad a little with the log splitter. 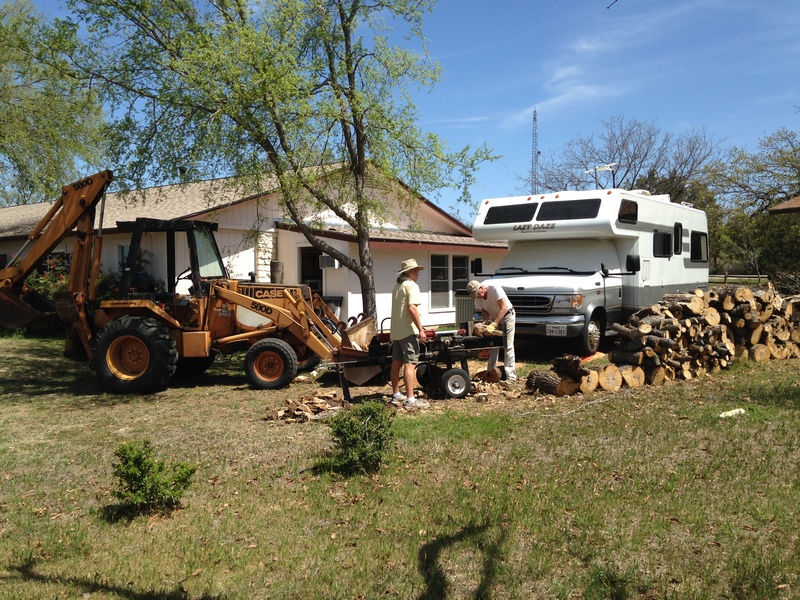 He had taken down a dying tree in the spot where my RV sits and stacked the logs until it was time to chop them up. The log splitting machine makes short work of the job, but is easier with a helper. We had a good visit before CB headed back to Eddy. Once the big logs are split they are carried to the other side of the house with the bulldozer-type machine. Better than a wheelbarrow! Riley got some stuff done, too. He had his annual exam, 3 visits to the groomer, and a dental cleaning. Not his favorite things, but he is in good shape for a while. 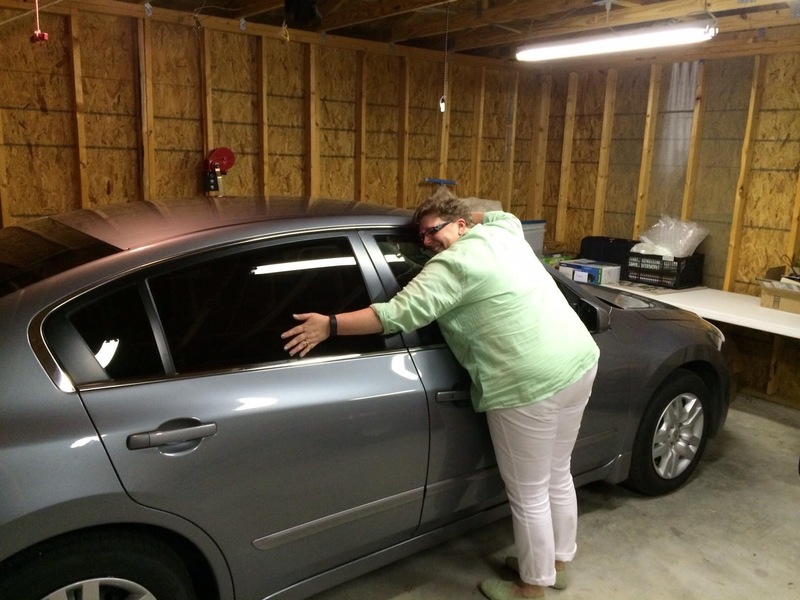 Just before leaving I completed one big item – I finally sold my car (2009 Nissan Altima). I loved that car and didn’t want to sell it. I didn’t have time to sell it when I was back for a visit Nov./Dec. 2012, so it sat in the garage for another year. My dad drove it once a month for exercise, but it’s not efficient to pay insurance, registration and depreciation just to have it to drive during the winter. My sister-in-law Bev was possibly interested when we talked about it at Christmas, but they weren’t really looking to buy at that time. I ended up putting it on Craigslist at the end of March and posted a note to my friends on Facebook. Bev saw it and the timing was right. Ken and Bev decided to buy it, picking it up on the the weekend before I left to go traveling. I got a picture of Bev on Friday night, when we went out to the garage to go over the bells and whistles on the car. I think she will enjoy the car as much as I did. It was nice to have a car when I came back for the winter. Not sure what I will do this winter. Probably hitch a ride to town when my folks go, borrow my dad’s truck on occasion, and rent a car for the weekend when I need to get a bunch of stuff done in Austin. Maybe in a couple of years I will trade the scooter for a towed vehicle. I’m not ready for that yet, but maybe later.